This entry was posted in Language, Non-verbal, Women & Families. Bookmark the permalink. This is a topic I was very intrigued with as it was unfolding; how the media was so very accepting and excusing of Kavanaugh’s expression of anger while also being so critical of Ford. 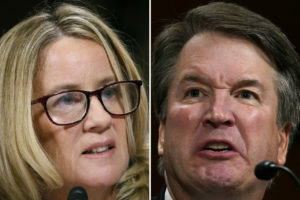 When watching the testimonies I remember when Kavanugh spoke it seemed as if he was guilty, he reacted in a manner that I perceived to be as someone who knew the truth but was speaking falsely. And Ford seemed as if she was trying to compose herself to enunciate her truth in order for there to be no question in her statement. It is important to view the testimonies not only on what was being said, but how it was being said.